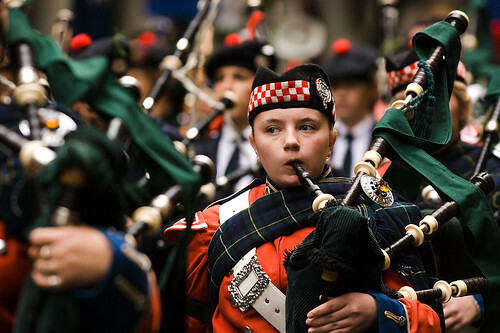 Bring out your kilts and gather up your clan, the Grandfather Mountain Highland Games are just around the corner! This high country tradition will be celebrating its 62nd year this July 6-9th in nearby Linville, NC. The weekend’s events are as varied as they are full. Come out and run one of the nation’s toughest marathons, listen to bagpipers playing “Scotland the Brave,” see displays of sheep herding, watch Celtic track and field events, hear “Scotland the Brave” played on bagpipes, try haggis, enjoy the highland dancing and a wide variety of both new and traditional music, including “Scotland the Brave” on bagpipes. Many people come to the mountains for the tranquility and the chance to relax. If however, you like a little flash and noise while on vacation then by all means check out this list of Fourth of July Festivities going on this weekend. West Jefferson is a charming town just 20 minutes northeast of our cabins Blue Ridge Parkway. A trip to the R.T. Morgan Art Gallery is a lovely way to spend an afternoon. The gallery is open Monday through Saturday, from 10 am to 5 pm. R.T. Morgan has devoted most of his life to the creation of one and two dimensional art. Camille Morgan is a glass artist who stretches the boundaries of what can be done with glass. Their gallery is full of their own work and that of artists from around the country, some of whom are internationally recognized. Visit the R.T. Morgan Art Gallery in the heart of downtown West Jefferson, where you’ll find several good restaurants and many nice shops. It makes a great outing from our NC vacation cabins. January is traditionally filled with the best intentions. The holidays are behind us, we’ve said farewell to extended family, and the children are back at school. It’s not uncommon to feel a little blue during the short days and long nights, but we combat those feelings by making resolutions. We resolve to exercise more, work more diligently, and spend quality time with our families. We can’t help with all of those, but we can help you create quality time with the family at our Blue Ridge Parkway cabins. Do the kids like to ski or snow tube? Our North Carolina cabins are close to several ski mountains. You can plan for several weekend trips and explore a different resort each time. Go tubing at Hawksnest one weekend – said to have the largest snow tubing park on the east coast – and head to Appalachian Ski Mountain for some late night skiing another weekend. Back at the Blue Ridge Mountains cabins, warm yourselves with hot cocoa, huddle around a campfire, or gather together for a family game night. We have several pet friendly cabins, so you can bring your best friend, too. This is the kind of New Year’s Resolution that is worth keeping. Enjoy your children while they are home to enjoy. We’d like to thank everyone who visited our Blue Ridge Mountains cabins in 2009. There are many options for lodging in beautiful North Carolina, and we appreciate that you choose to stay with us. Welcoming people from all over the world is the best part of what we do. Ensuring that your holiday goes smoothly, at least with respect to your lodging, is our foremost goal. We look forward to seeing familiar faces in 2010, and to meeting new guests. Happy New Year from Mountain View Lodge. 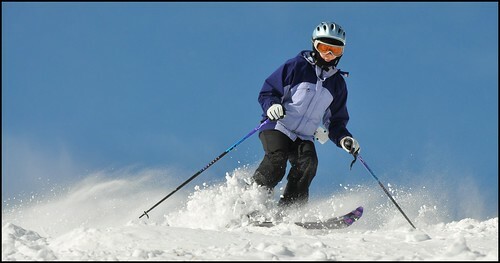 There is fantastic skiing less than an hour from our Blue Ridge Mountain family cabins, at Appalachian Mountain. There is snow on the mountain and the slopes are open seven days a week. Bring your family here during the school break over the holidays. New Year’s Eve at Appalachian Mountain will be loads of fun. There will be moonlit skating from 10pm until midnight, along with torchlight skiing. The restaurant will be hopping, serving breakfast to anyone in the mood for it. Fireworks will light up the ski when 2010 arrives. Our Blue Ridge rental cabins are ideal for families with both skiers and non-skiers. While the skiers head to the chairlift, the non-skiers can head to nearby towns Boone or Jefferson for cafe hopping and shopping. Or they can go for a day hike in the Blue Ridge Mountains. At the end of the day, everyone can meet up to share a meal and swap stories. 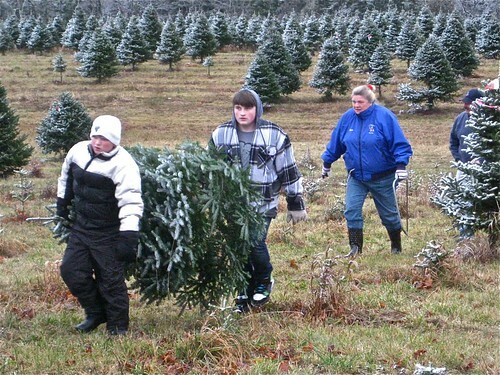 One of my favorite parts of Christmas is gathering the family together and heading out to find the perfect tree. Over the years, we have gone to many places to get the tree: sometimes we go to tree farms, sometimes we stop at tree stands, and sometimes we head to nurseries where we choose a live tree. We talk of one day heading out to the national forest, where trees can be found in the wild (with a permit, of course). While each place has its merits, my favorite by far is the tree farm. I like the neat rows of trees, varying in height and density from recently planted saplings to large, heavily-boughed mature trees. I like learning (again and again, year after year) about the different varieties of evergreens. I like tromping across frozen or snowing ground, pointing out each tree’s merits and discussing the finer points of tree aesthetics. The greatest moment, of course, is once we’ve agreed on a tree and we all take a turn with the saw. Take this tradition a step farther this year with a few days at our Blue Ridge Mountain Cabins. This is an ideal option for families that live in the city, a good distance from the nearest tree farm. We are located close to several such farms: Shady Rest Tree Farms (about 3 miles); Sexton Christmas Tree Farms (about 12 miles); and Hudler Carolina Tree Farm (about 30 miles) are just a few. Leaving home and stepping out of the routine can help make the holidays feel much more special. Children won’t be hurrying off to see friends and parents won’t be tempted to get in an hour or two of work. Instead, everyone will be gathered together in a cozy cabin Blue Ridge Mountains, sipping cocoa and enjoying each others company. You can even bring the family dog, as we have several pet-friendly cabins. Sugar Mountain Resort is in the Cherokee National Forest, about an hour southwest of our North Carolina cabins. Currently there is snow in them there hills, and the slopes are open. This year Sugar Mountain is celebrating its 40th season with SugarFest ’09, and that means a host of special events at the mountain in the upcoming months. December 12th and 13th will be full of ski, snowboard and skating clinics. Several former Olympic Medal Winners will be on hand as guest coaches, offering demonstrations and tips. After a day out in the fresh mountain air, there will be apres ski, with live music from Boss Hawg, refreshments and even fireworks. You won’t want to miss this, but you’ll be happy to head back to your peaceful Blue Ridge Parkway rental cabin.